Jenny Nyberg, MA in archaeology and BA in History, is an associate research student visiting the Queen Mary Centre for the History of the Emotions during February and March 2012. She is usually based at Stockholm University as a PhD candidate in archaeology. In her thesis she investigates beliefs, emotions and attitudes towards death in early modern Protestant Sweden (1500-1800) by studying the material remains of burial rituals. By looking at how the dead body was prepared, dressed and adorned, and what objects were included with the dead in the coffin, she is tracing understandings of death and acts that were driven by beliefs and emotions. This guest post summarizes some of the results and ideas that she presented at her lunchtime seminar at Queen Mary on 1 March 2012 entitled ‘For to me to live is Christ and to die is gain. The study of beliefs and emotions through Swedish early modern graves’. Throughout the early modern period the body of the deceased was commonly prepared at home, shown during the wake or when laid in the coffin, and then often kept at home before closing the coffin lid and departing to church for the funeral. We know from written sources that many people gave detailed directions on how their funeral was to be held – including asking to be dressed or shrouded in a particular garment or material. The final product, that is the grave, can in many cases be seen as a negotiation between the wishes of the dead and the living. Key to my interpretations is that preparing the body and keeping it at home enabled the bereaved to physically relate to it – both during a collective ritual and perhaps also in a more private manner – before the coffin was closed. Convinced that not only the act of social transformation of the dead, but equally the expressions of emotions are essential to understanding burial practices, I’m trying to develop a theoretical framework for understanding how emotions were expressed through material actions in the ritual context and how and why those expressions changed over time. Such a framework must recognize that emotions are entangled with other aspects of social and cultural meaning and experience; such as social identity, gender, age, religious beliefs – but also emotional beliefs, since what people thought of emotions itself influenced their experience of them and thereby also how they were expressed. In their 1986 article ‘The Anthropology of Emotions’, Catherine Lutz and Geoffrey White presented an overview of the anthropological research dealing with the relationship between ritual and emotional expression. The ritual has been seen as allowing a channeling and “working through” of emotions, as distancing people from emotions, as an aid in expressing spontaneous emotion and as only occasionally aiding people in their “emotional work”. The way I see it, all of these statements can be true – and this is because the participants are all individuals – each individual most likely also entering the ritual with different state of minds. What they all have in common is a commitment to take part in collective actions out of the ordinary; a commitment made possible since the form and purpose of the ritual are stipulated beforehand. For the social transformation of ritual to take place each actor must either internalize or formally submit to the norms of the collective (Humphrey and Laidlaw 1994). The graves I study are the results of ritual acts legitimized by the collective, where the emotional norms and values of a society have been expressed – partly through material practice. As pointed out by Sarah Tarlow, a pioneer within the archaeology of emotions since her 1999 publication Bereavement and Commemoration. An Archaeology of Mortality, recurring material patterns therefore mirror those values. This is not a far cry from historian Barbara Rosenwein’s idea of emotional communities, meaning social groups that share “the same valuations of emotions and their expression”. The “feeling rules” within the particular community would have provided a spectrum of culturally accepted ways to express emotions during the ritual. Let us now direct our focus to how the Swedish nobility dressed their dead for burial in the 1600s and how that changes within the following century. At the beginning of this period women, children and men were dressed in clothes worn in life made of luxurious materials – velvet or silk. 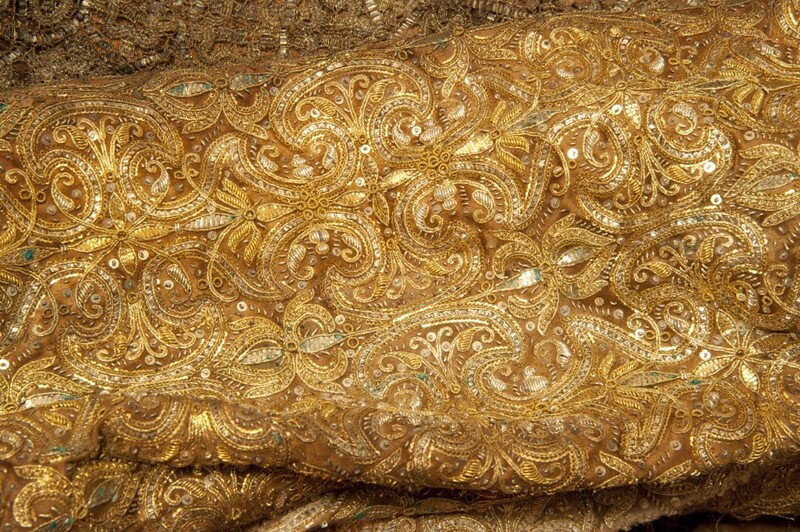 The photograph below shows a detail of the elaborate gold embroidered dress of a noble woman who died shortly after childbirth in 1653; the dress was most likely her old wedding dress. Detail from an embroidered dress found in a grave in the Brahe Church, Visingsö, Sweden. Photo by: Göran Sandstedt, Jönköping county museum. The festive and luxurious way of dressing the dead in the seventeenth century should be seen in the framework of funerals being big, expensive gatherings where the dead were dressed up for their final festivity. Apart from funerals being arenas where the status of the nobility, believed to be conferred by nature, could be manifested, created and re-created – displaying grandeur becoming almost a virtue – death was also portrayed as a celebration. How then shall we understand this seventeenth-century metaphor of death as a celebration? I believe we need to relate it to contemporary understandings of emotions – or rather passions and affections. They were both believed to stem from the soul. Passions, were strong, appetite-driven stirrings that should be avoided by Christians. Affections were moderate, virtuous, and godly and associated with intellect. Religion therefore offered a correct mode of mourning. Passions of excessive grief could suggest both selfishness and doubts about the wonderful nature of afterlife; they could constitute an affront towards God. Although one can discuss how far scholarly ideas on passions and affections reached into the lives of “ordinary people”, it is clear that this ideal of moderate mourning was internalized by people with examples also prevalent in the folklore. Grieving for a person too much would hinder their entrance into Heaven. The rhetoric of death was therefore a very positive one. When going through written firsthand accounts, like diaries, it is however obvious that the bereaved could have trouble resigning to the will of God. Towards the turn of the century, around 1700, there is a remarkable shift towards simpler shrouds more similar to night clothes. Instead of silk and velvet, white linen is now used. Although these simpler shrouds existed earlier in the century, likely a demonstration of piety, now even the royals are shrouded in this simpler fashion. The metaphor of death as a celebration is now replaced by the metaphor of death as a peaceful sleep. So how are we to understand this development? There is evidence that this shift was wanted. During the latter half of the seventeenth century, laws were passed – some on the demand of the nobility and burghers themselves – to limit the number of participants allowed at the wake to mere relatives, and to make the burial ritual less extravagant – among other things minimizing funeral processions. I think that what we have here is a more family oriented view on death and a different relationship to God, where the grand rituals of the earlier period now appeared hollow and meaningless to the bereaved. A new virtuous ideal of economizing had also gained hegemony as burghers during the seventeenth century were offered to work their way up the state ladder, the majority of them given noble titles. The simplicity can also be related to a more privately held religion influenced by Pietism and the Moravian church spread from Germany. With wishes from both burghers and nobility to make the ritual simpler – we appear to have an emotional community transcending the boundaries of social groups coming to the fore. I would like to see this emerging as both a response to changes in social identities and religion but at the same time to recognize that expressions of emotions have contributed to those changes. This view would interpret burial rituals as something similar to William Reddy’s “emotives: emotional utterances – in this case performed and material utterances – that have impacts on their surroundings. Rather than viewing the burial ritual as an arena that simply canalizes or restrains emotions, perhaps we can also see it as a place where emotions are created, recreated and also changed through material “emotives” performed by the participants? If a religious model of the experiences of emotions is part of the explanation for the seventeenth-century metaphor of death as a celebration – how then can the experiences of emotions have changed throughout the following century, affecting how emotions were expressed towards the dead body during the burial ritual? This entry was posted in Queen Mary Events and tagged burial, emotional objects, emotives, graves, grief, ritual, Sweden by Jenny Nyberg. Bookmark the permalink.